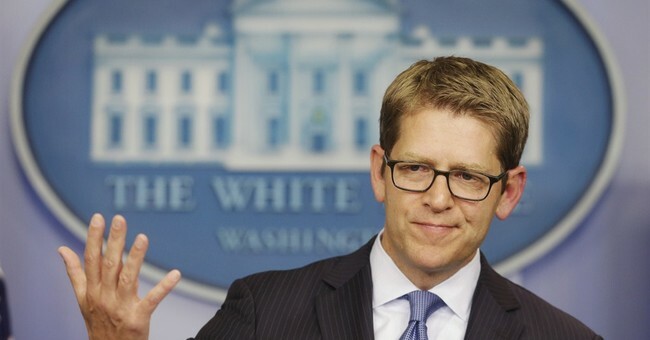 White House press secretary Jay Carney hedged Monday on whether ObamaCare’s individual mandate could be delayed because of problems with the healthcare law’s enrollment web site. Carney did not directly say the individual mandate could be delayed, but he did say that if people could not get access to ObamaCare, they would not be penalized. Under the healthcare law, uninsured Americans are required to sign up for health insurance. If they don’t, they could be hit with a fine. Carney was asked Monday if people would have to pay a fine if they couldn’t enroll in ObamaCare because of a glitchy website that the administration has struggled to fix. ...After reading the White House-provided descriptions of each of those behind the president, it's clear the administration was stretching to present people who, beyond supporting Obamacare, have actually gained from it in any tangible way. For example, a Pennsylvania man named Malik Hassan was in the group, and this is the White House description of his situation, in full: "Malik Hassan works at a restaurant in Philadelphia. Hassan, who does not receive coverage through his employer, is looking forward to enrolling for health coverage this fall. He recently used Healthcare.gov. to process his application and is waiting for the options for potential plans in Philadelphia." So, Hassan is employed, not covered, and has not yet succeeded in finding coverage through Obamacare. That is, in the White House's estimation, an Obamacare success story. Then there is Nathaniel Hojnacki, who recently finished his schooling. Here is the White House description of his situation, again in full: "Nathaniel Hojnacki recently received his Master's degree at Johns Hopkins University SAIS and is in an employment situation without benefits. Hojnacki recognizes the importance of coverage and is planning to enroll after he explores his coverage options on the DC exchange." So, Hojnacki has a job, does not have coverage, and is planning to explore finding coverage through Obamacare. Another success story. Indeed, it appears that just three of today's 13 human props are actually enrolled in Obamacare's exchanges. Perfect. Will anyone be held accountable for these mounting, crippling, mind-warping mistakes? Will Kathleen Sebelius even appear before Congress to explain herself? Maybe. At some point.